This article is written for 32 bit operating systems. Unless explicitly mentioned, Windows 7 and Vista refers to the 32 bit edition of the respective Operating Systems. Couple of months back, I had blogged about a peculiar Windows 7 issue which could cause a BSOD (Blue Screen of Death) if the system had 4GB (or more) RAM. I managed to find a fix for that issue. But, I had another minor niggle to figure out. Although I paid for 4GB of RAM, Windows refused to use more than 3GB. If you have 4GB or more RAM then you are probably familiar with the following screen. Computer Properties displayed installed memory as 4GB but at the same time stated that only 3 GB is usable. So, where did the remaining memory go? As it turns out, chunks of your RAM are reserved for various purposes and are not available to the operating system. For example, PCI Express support will reserve 256-768 MB depending upon the graphics adapter. Due to this Windows always displays less than 4 GB RAM as the amount of usable memory. Depending upon your hardware, anywhere between 2.75 GB and 3.5 GB of RAM will be available to the OS. But, what if you have more than 4 GB RAM? 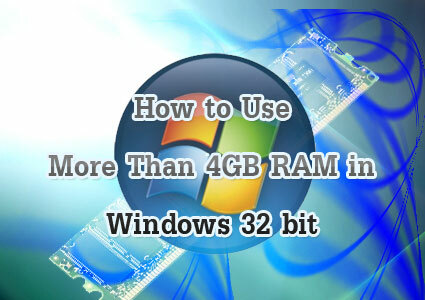 Even on a system with 32 GB RAM, 32 bit editions of Windows will display less than 4 GB of memory. This is a known limitation of the Windows Vista and 7 x86 editions. Microsoft claims that it is not their fault and is instead a limitation of the 32 bit architecture. At first glance this seems correct. 32 bit processor using 32 bit registers should be only able to address up to 4 GB of RAM (232 = 4G). However, this is not actually true. The main reason being a feature called Physical Address Extension (PAE). PAE makes it possible to address more than 4 GB of memory using 32 bit registers, since the registers aren’t used to store the physical address. Instead, the registers store linear addresses, which are mapped to physical addresses using the page table. This feature has been available since the days of Intel Pentium Pro. In x86 processors additional address lines are provided so that up to 64 GB can be addressed when using the PAE mode. If you want to learn more about Windows memory addressing, go through Geoff Chappell’s notes. 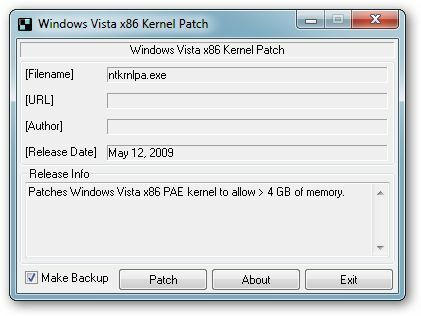 Windows Vista and 7 have two kernels – one which doesn’t use PAE and one which does. They are NTOSKRNL.EXE and NTKRNLPA.EXE respectively. Both of them reside within the Windows/System32 directory. Can you guess which one you are using? If you have a modern machine, then chances are that Data Execution Prevention (DEP) is enabled in your system and in that case you are already using the kernel with PAE enabled. Before getting started, keep in mind that this patch involves modifying the kernel. Do no proceed unless you are confident. Most security products will identify these patches as malicious since they modify the Windows kernel. Download the appropriate patch for your system (links at the end of this post). I haven’t tried the Windows Vista patch, but I can confirm that the Windows 7 patch works. The Windows 7 patch is in Russian language. To begin patching click on the big button (refer to screenshot). After this a command prompt window should appear. Press Y. On restarting the system, you should see two entries in the Windows Boot Menu – one being the older configuration and the other being the one with support for more than 4 GB RAM. If you don’t want to be prompted every time, press Win + R, type msconfig and hit Enter. Under the Boot tab, reduce the timeout value (to something like 3 sec). If you wish, you can simply get rid of the older configuration by deleting it. But I wouldn’t recommend this. 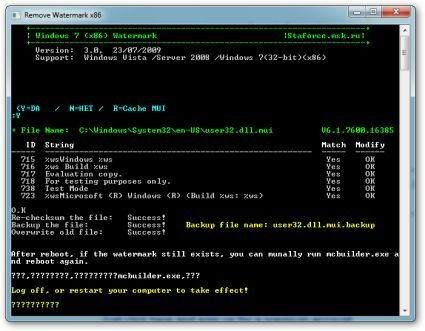 If you get a water mark (Test Mode) on your desktop after restarting, type mcbuilder.exe in the Start Menu and press Enter. This patch will allow the OS to use more than 4 GB of memory. However, it does have a limitation – more than 3 GB of memory cannot be allocated to a single application. This patch is mainly targeted at systems with more than 4 GB of RAM. However, in some cases installing this patch on 4 GB systems will also lead to an increase in available memory (which may not necessarily result in performance improvement). This may appear to be a bit strange since Windows 7 and Vista are technically capable of addressing up to 4 GB of memory. Obviously, there is a logical explanation for this behavior. But, I won’t discuss it here. Refer to Geoff Chappell’s notes on Physical Memory Map if you wish to explore the issue in detail. Warning: The patches described in this article are kernel patches. They may result in unexpected hardware issues and expose your system to malicious exploits. Thanks Pallab for the post. .-= Anish K.SÂ´s last blog ..Installing Fennec on Nokia N810 =-. The link is fine. Anyway, I added mirrors for both the files. Thank you very much for this post. The patch works great for Windows 7, very stable. I have 8 gigs of ram and was only registering 3 gigs of it before the patch. How can i do rollback of trhis patch. I have BSOD’s every 10 mins! The Vista patch creates a backup of the ntkrnlpa.exe. You need to replace the patched file with the original file (backed up). For the 7 patch use msconfig to remove the patched bootmenu entry. well all is well under the hood here , many thanks for the tip ! now does anyone have any views on what to do with the paging file now that the ram has changed?. with 6bg of ram what are some suggestions to make min & max ?, and is it benificial to use a flash drive to put the pagging file on if no other hard drive is available? Glad that the patch worked for you. As far as paging file is concerned, I don’t believe in the 1.5x theory. It makes no sense. A system with a small amount of RAM would require a large page file while a system with a large amount of RAM would require a smaller page file. Not the other way around. I wouldn’t allocate more than 3GB to the page file. However, the most important thing is to set a specific value. Don’t set a range. Otherwise the OS would be busy just resizing the page file. It is better to have the page file on a separate hard disk. If that is not possible place it on a different partition. Even better, use a 4GB high speed pen drive in Ready Boost mode. This would burn out the pen drive in a few months, but they are quite cheap anyway. so are you saying to keep both the same size then, and STILL GO WITH THE READY BOOST, I HAVE A 8GB HI SPEED AND WILL TRY IT. what program could i use to see if there is any difference?? 8GB of ready boost is going to be an overkill. You can use a cheaper 4GB usb drive (if you have it). I am saying this because, make no mistake about it – Readyboost will reduce your usb drive’s lifespan. If you are going to use readyboost, I suggest setting a really low page file size (1024MB) should be enough. You can try 3d benchmark software like 3DMark. I got a significant performance boost with ReadyBoost in games. Normal application performance won’t be vastly different since most of them simply don’t use more than a couple of hundred MBs of RAM. what are your thoughts on superfetch?? make your paging file 1 and 1/2 x the size of your ram. so for example if u have 4gb ram make paging file 6gb..
9 gb for the max, ?? I have 4GB RAM so i got the Windows 7 64bit version instead. The link for windows 7 32 bit is no longer available. Can anyone post me the link? or better still email the file?. Hue C.M, I am looking for the same W7-32Bit file. If you get it from somewhere could you either send me the link or email me the content. Hi guys, I have updated the links. Thanks mate. It worked perfectly fine for me..
Hi, I have done the steps, downloaded the file and everything. but after checking the resource monitor and system properties, it still says 3.0GB usable ram. Mine is still only showing 2.87GB ram available (4 installed) ! What’s wrong with the patch? Confirm Success with Windows 7 Pro 32 bit (ver 6.1.7600 after patch). No issues, the patch went smoothly. I show 4GB out of 4GB RAM available to the system. I’ll note that my mainboard has a Intel Broadwater i946GZ Chipset. The 946 series is a slightly later model than the 945GM/E/PM Calistoga Chipsets. All of the 945 series chipsets will not address above 3GB Ram – Period. Can anyone please tell me how to find out what chipset I have? I am wondering if that is why it won’t work. Thanks a Lot Pallab, Eventhough McAfee detected it as PUP, I went ahead. Worked perfectly and shows watermark on Homescreen as “Test Mode” though. When I tried the Win 7 patch on my 32 bit Enterprise version, I got only blue screens on boot and had to revert to the unpatched version. Could this be due to BitLocker being enabled? Win7 build 6.1.7600.16617 with 4GbRAM installed. The patch was successfully installed, but system still just recognize 3Gb instead 4 Gb. Is this patch only work on Win7 build 6.1.7600.16539 ? This patch adds a old kernel ver 6.1.7600.16397 and patches nothing. My system version is 6.1.7600.16617 – fails on boot. I think there’s instruction on how to modify the offsets and patch properly. I The patch was successfully installed, after the startup there was this at the right bottom end of the desktop – “TEST MODE , Windows 7, Build 7600”. ( I hope this is the watermark that was mentioned.I did type mcbuilder.exe in the Start Menu and press Enter. But the new display did not vanish. Is this normal? Or how to fix this. I have run this Windows 7 patch and it has worked flawlessly for several weeks. If I needed to, is there any way to uninstall this patch? Still not working. “string not found” is what I get when I use the patch. Still only using 2.87gb ram, when there is 4GB installed! I The patch was successfully installed, after the startup there was this at the right bottom end of the desktop – “TEST MODE , Windows 7, Build 7600?. ( I hope this is the watermark that was mentioned.I did type mcbuilder.exe in the Start Menu and press Enter. But the new display did not vanish. Is this normal? Or how to fix this. I have downloaded the patch. What should i do after i downloaded the Patch? I am bit confusing. do not belive stupid man not workin! Seems strange that the smart people at Microsoft won’t release a patch to allow for the 4gb, but maybe they know something more than us? The “PATCH” it’s working just fine, i used this “PATCH” in 3 computers Desktop for 1 year end 4 months all three computers have installed Windows 7 Ultimate 32 bits !!! 1. Step 1, before starting installation disable antivirus software from your computer in all four categories:Antivirus Protection,Antispyware Protection,Personal Firewall,Antispam Protection!!!!!!!!!!!!!!!!!!!!!!!!!!!!!!!!!!!!!!!!!!!!!!!!!!!!!! – Domain Profile—->Windows Firewall is off! – Private Profile—->Windows Firewall is off! – Public Profile—->Windows Firewall is off! Now, just follow step by step what was written in the article above!!!!!!!!!!!! For eveyone; this is just a PAE extension patch designed to allow the system to allocate more RAM to applications which ONLY support PAE. Microsoft confirmed(via SF) that this patch is actually useless. It will obviously make the system detect all the RAM but that is useless since it will still be unusable althought all RAM is detected. Messing with the kernel might cuase BSODs like BC3B and BC7F. Just use X64 versions of windows to avoid any issues with this. You have no idea what your talking about. Instead of posting useless information please read up or at least attend a pre school and learn the very basics of computer usage. This patch worked like a charm for me!! I went from 3GB usable to 3.75GB usable and I do notice a difference with performance in general! Also, for those who need to run “mcbuilder.exe”, open a command prompt (right-click and ‘run as administrator’ for elevated permissions) and type mcbuilder.exe to get rid of the watermark. It’s very simple dude…if you have a pc with 4GB of RAM and you have a CPU that is not 64bit compatible, like lets say Centrino Duo on Lenovo T60 laptop, then you definitely need this since you can’t use 64bit OS. Is it clear now for you? Or you are going to say now “buy a laptop with 64bit CPU and install 64bit Windows” ??? I have window Vista at the moment, i hate it soooo much! I want to turn it into window xp is that possible? I have a window Xp disk that i bought a while back. My question is: Is is it possible to reformat window vista to Window XP.Thanks a lot. y the heck do people still use XP! I figure whether it works or not for some people, and it makes sense that what he has said is pretty crystal clear. Realistically, the simple fact that someone has tried to help others deserves a pat on the back. I think it indicates quite clearly “If in doubt, don’t” – basically. I didn’t realize you could do this . thanks for theinfo this helps out a lot. does anyone know how to fix this in the 64 bit version? On Windows 7 Ultimate x32-bit System it does work perfectly. is this patch compatible with sp1? i have myself the same problem, 1 have instaled in my pc 4 gb, but my pc only shows me 3 gb. i try to use this patch, and many others. in this patch, i get the message ,,Can not fint the file.Search the file?” i click yes, i find th file myself C:\Windows\System32\ntkrnlpa.exe and after, when i do it says ,, Can not acces file.Maybe it’s in use … Please close the file before patching. Try to acces the file again ? ” what should i do ? please help me . I ran the software.When prompted to choose the operating system, I chose “vista…(>128 gb)”. But it didn’t start, because of a missing “PSHED.dll”. So I turned back at the original OS (fortunately, not damged). Could you give me an explanation and a solution? thanks a milion man it show 5 gb from 5 gb installed~!!!!! The solution is to open CMD, as an administator, type in “mcbuilder.exe” hit enter, and reboot. It worked for me after that! Hope this helps you out. I no longer use a 32bit edition, but I did use 32bit edition in the past with all 4GB RAM visible without problems. It also removes the need to run in test mode. However, it does not work for everyone, mainly due to buggy drivers. Is not working with Windows 7 ultimate edition. I try three times and nothing. worked like a dream on my Windows 7 Ultimate 32-bit. Rebooting showed all my 8gb of ram available. How can i remove the patch? Hi, i’ll try to use the Windows Vista patch but I received alway the follow message: cannot acces the file. Maybe it’s in use… Please close the file before patching! Try to access the file again now? Does someone have a sollution? lasciate perdere questo articolo il processore a 32 bit non può usare più di 3 gb di ram quindi anche se usate questa patch windows vedrà che ci sono più di 4 gb di ram installati ma ne userà comunque 3 perchè l’archittettura a 32 bit non supporta più di 3 gb di ram. I’ve been running the patch overnight, and it really feels like the windows processes are taking longer, based on the spinning blue wheel. Explorer gave me a blue wheel just to open a new instance. Really strange since there’s more memory available now. The information given here is very interesting and useful and I would like to try using the patch. However, I would like to know if the Win 7 patch can be used on Win 7 Ultimate with SP1? Yes pls tell how remove it? coz on some games after this patch my fps are very very low. Never did, neither will, trust russian (patches). Can you make patch for Windows 8 32bit? .But if you reinstall windows 7 you will have to run the patch again. You can’t install within windows xp. I’m really pleased with this patch,no problems at all applying it, but I did make a backup of my system before using the patch. Also it’s a good idea to run “msconfig” and reduce the boot timeout to 3 seconds, so as to skip the delay in boot options that the patch creates. I had a problem after installing a game where my memory was only showing 450mb and the computer was very slow after I uninstalled the game. In the boot, advanced, window of “msconfig” I was able to reset the memory to the full 8gb. Don’t know if this was caused by the game or the patch, but it hasn’t happened since. It’s great to be able to burn 12 dvd’s in succession without having to reboot the computer now that I can access all my ram. I just had a friend who had this issue and we couldn’t’ figure it out. I can’t believe I didn’t think of this thanks. Thanx a lot men, it works great on Win7. It shows 16GB. And my problems with video reendering out of memory errors are gone. nice I didn’t know there was a fix for that. Installed the patch on my DELL Windows 7 and it worked like a charm. It now addresses most of the 12 gig. I can load several program at once which I do with 3 screens with plenty of memory left over. Before I was using upwards of 80% of my available memory. will this not work for 7 64 bit ??? It’s because your board has the GMA 3100 integrated graphics which is using part of your RAM as shared video memory and chipset limitation. From what I’ve seen this board with the default BIOS can only address up to 4GB of RAM. This has nothing to do with Windows, the issue is your BIOS. Your board uses the G33 Chipset which technically supports up to 8GB but Dell used (I assume you’ve got a Dell because they’re among the few using that board) a BIOS which limits the max RAM to 4GB. Moreover Dell states that each memory slot on that board can hold DDR2 PC2-5300,DDR2 PC2-6400 modules with a maximum of 1GB per slot. Basically only 4GB can be ‘seen’ by this BIOS revision. Check if there’s a BIOS updates that allows the full RAM to be addressed. No it won’t. Moreover XP is 10 years+ old. Upgrade to at least Windows 7 64-bit. @manuel, adding more RAM does NOT increase performance, it will only allow the system to run more apps at the same time. The GT440 is a low end card, you can do almost nothing to improve its performance. That system of yours needs to be replaced if you want better performance. BF3 is more GPU intensive, it will require a midrange card like the 660Ti/AMD equivalent and a decent processor from the Intel i3/i5/i7 series for best results. You can’t expect it to run at nice fps with such a dated system. A better GPU wouldn’t really improve performance since you’ll have a huge bottleneck especially with your current LGA775 processor which is dated. You are wrong on both comments. I am a first hand account of both of these enabling me to game better. I couldn’t play COD Black Ops without enabling the 4GB Ram unlock without it being choppy and I’m on a Dell XPS 720 with dual nVidia 8800 GTX’s, only use one now as the other went out and I’m about to upgrade to the latest. Every time my PC starts now it automatically enables the 4GB-Ram, I wouldn’t run my PC without it, been doing this for 4 years now. A better GPU will definitely improve performance, I have never heard someone say the opposite, it’s like switching from Black tinted windows on your car to clear windows, you can finally see better. Or switching from a stock air intake to a modified cold air intake, you get a bit of performance out of it and the engine runs better. Try SFC or a Repair Install. I tried this solution but my laptop doesn’t boot with that patch on. The laptop goes all black and doesn’t boot at all..
please send me an email helping me. Not working for me on 2 Vista32sp2 machines (different architectures). Use the Vista OS boot disk to get to cmd prompt, and copy backup file to original, in c:\windows\system32. For me it doesnt work unless I uninstall the driver for the Intel 4000 graphics card. I guess it’s a problem with sharing the memory between the system and the graphics.